Immigrant Families Together was founded in June 2018 in response to the inhumane immigration policy separating families at the U.S./Mexico border. We pay bonds for parents in detention and work to reunite them with their children. Additionally, we support over 100 reunited families as they recover from their detention trauma and adjust to life in the U.S. while their asylum cases are adjudicated. We are NOT a 501(c)3 organization. NONE of the IFT volunteers are paid. ALL of your funds will go directly to rapid response needs. - Pay bonds to release detained immigrants. - Legal and relocation costs for related detained immigrants. - Acute needs such as medical, food and transportation costs, clothing, blankets, car seats and diapers for families who have been released, and temporary housing stipends for refugees who have just been released from detention and have no family in the U.S.
- Operating costs to cover emerging needs and infrastructure. We will withdraw all donated funds to Julie, the leader/organizer/founder of Immigrant Families Together. A note from Julie about an upcoming fundraiser this Sunday-- Dining For Justice.-- and the upcoming 1 year anniversary of a sordid policy. If you CAN come to the fundraiser, we'd love to see you: it's the most delicious place to be. If you can't come, you can purchase a ticket and donate it to someone who can. Donations, as always, are so welcome. Reminder: We are not currently 501c3, so donations are not tax deductible. This past Saturday, April 6, marked one year since former Attorney General Jeff Sessions announced the Trump administration's "zero tolerance" policy. As you know, that policy resulted in the cruel, unnecessary separation of thousands of asylum-seeking parents from their children. Parents were put in ICE detention centers (make no mistake, these are for-profit prisons), while their children were, in most cases, sent to foster care agencies around the country, including right here in New York City. To mark the one year "anniversary,", the Trump administration made a new announcement on Saturday: It says it could take up to TWO MORE YEARS to reunite children who remain separated from their parents as a result of the zero tolerance policy. 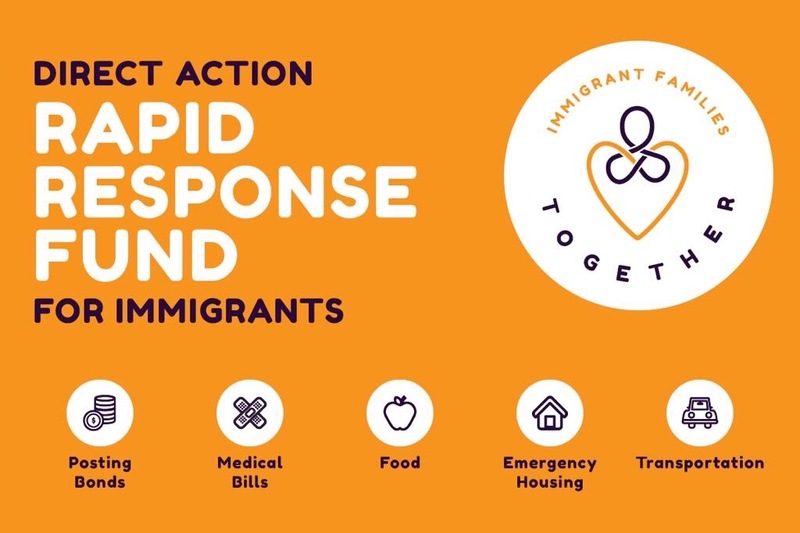 Since June 25, 2018, Immigrant Families Together has raised money and posted bond for more than 70 parents, grandparents, and older siblings who came across the border and have been separated from children as a result of both zero tolerance and immigration detention generally. We have provided ongoing support to many of these families, ensuring that they have legal counsel, medical, mental health, and dental care, housing, food, clothing, transportation, and access to social and emotional support. Just last month, the sixth mother for whom we posted bond became the first of the 70+ adults we've bonded out to be granted asylum. She is now free to build a new life in the United States with her two children. We know that not every parent will be granted asylum, but IFT's end goal is this: to make sure that all families we are supporting have the opportunity and the resources to live the healthiest, safest, most stable lives possible while they are proceeding through the immigration court system. This Sunday, April 14, from 5-8 PM, Chef Jonathan Forgash will be hosting the second iteration of Dining for Justice, a food hall fundraiser featuring 25 chef, beer, and wine tasting stations, as well as live music from Seth Goldberg and MG4. Your ticket also gives you access to an online auction filled with restaurant gift certificates and other goodies. Proceeds from the event go directly to support the families who are in IFT's care. Even if you can't attend, you can purchase a ticket and gift it to someone who can! Please feel free to forward this email to friends who might be interested in attending. I spent the entire day shopping on Instacart for 5 orders for 190 different items totaling nearly $850. I shopped multiple stores for the best values and prices like I always do and I ask the shoppers to please help us if they notice a less expensive item or better value because we are feeding a family in need. One of the shoppers, I’ll call J, called me to ask who we are and exactly what do we do. J said she noticed EVERYTHING we ordered was the best value and least expensive item available and the order was LARGE - as in over 75 different items, all GOOD food, no junk. AND ...that she had NEVER had this much food in ALL HER LIFE. This is one of the many things we do with YOUR donations. Were you wondering, but hey, where are the links to all that great journalism, and to IFT's events page? Right here! Please share these as widely as you wish, as they inspire giving and awareness. It's hard to believe that we started just nine months ago as a scrappy group of folks who were angry about Trump's zero tolerance policy, which resulted in the separation of so many families. A lot has happened since June 2018, when we launched our first GoFundMe campaign to raise bond and support money for Yeni, a mom who was imprisoned by ICE in Arizona while her children were taken from her and put into foster care in New York. Once we'd successfully gotten her reunited with her children -- thanks to YOUR donations -- her attorney asked us, "Do you think you can do it again?" We could and we did, and nine months later, we have raised and posted bond for nearly 70 moms, dads, grandparents, and older siblings who were separated from their families by ICE. Reunifying with one's children is just the first step in a long process toward seeking asylum, and adults can't work legally until their asylum application is filed and has been in process for several months. All told, the process of seeking a work permit can take more than a year -- and asylum can take even longer. How would you support your family with all their needs -- housing, clothing, food, health and dental care, transportation, and more -- without a job? This is why your donations are so important. In addition to paying bonds, we use your donations to provide ongoing support to families. We pay for or supplement housing costs. We send groceries and clothing. We pay for legal counsel is situations where no pro bono counsel is available. We help cover transportation expenses. And we pay for medical, dental, and mental health care costs. We can do this because you have helped us weave a large, strong safety net. Immigrant Families Together is filling in the deep gaps in care and service that exist for these families, especially during a presidential administration that is so hostile to immigrants and asylum seekers. Want to know more about what we've been up to? Please visit our website and take a look at some of the press coverage we've received recently. Nick Kristof of The New York Times, Katy Vine of Texas Monthly, and Gwen Moran of Fast Company are just a few of the journalists and outlets that have reported about our work and the families we support. Visit our "Events" page to learn about upcoming fundraisers and other activities we have coming up. And keep your eyes open for our upcoming episode on the GoFundMe podcast, "True Stories of Good People." Thank you for your support. If you can dig in and give again today, you know exactly the power that gift has.